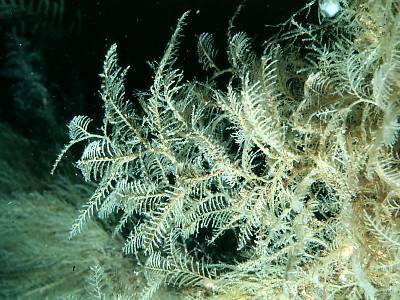 Description: The main stem of this hydroid is rather slender and the feather-like side branches are arranged in a spiral. The hydrothecae are on the upper side of the pinnae. They are grouped together in tight clusters of 2-5 hydrothecae, and there is 1 cluster to each internode. Within each cluster the hydrothecae curve alternately outwards from the axis of the pinnae. The gonothecae are oval shaped and smooth, with a short neck. The rim of the aperture is smooth. Habitat: A typical species of tide swept, sand-scoured sites, attached to stones, boulders, wrecks and bedrock. Similar Species: This is a very distinctive species. Picton, B.E. & Morrow, C.C. (2016). Hydrallmania falcata (Linnaeus, 1758). [In] Encyclopedia of Marine Life of Britain and Ireland.